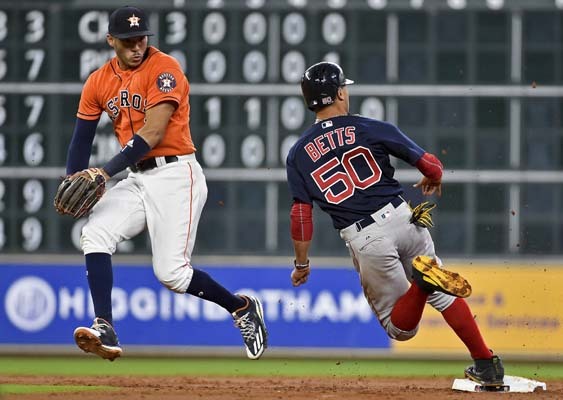 HOUSTON -- Mookie Betts showed off his defense and offense Friday night. 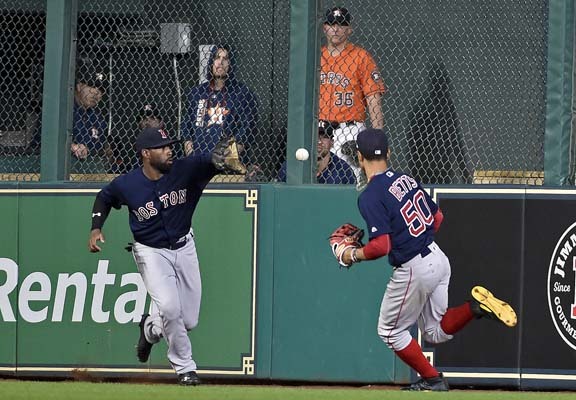 Betts nailed George Springer at the plate to end the sixth before giving the Red Sox the lead for good two innings later. 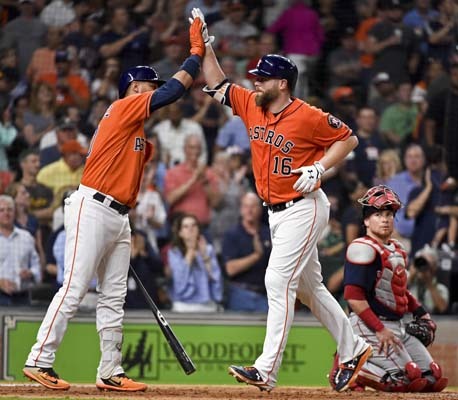 Betts hit a tiebreaking home run in the eighth inning, sending the Boston Red Sox over the Houston Astros 2-1. 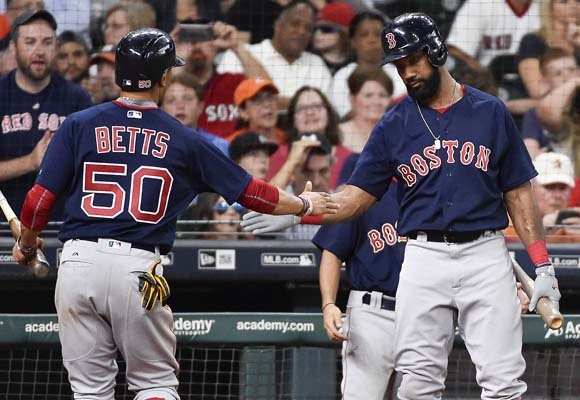 "Home run came at a big time, but I think more fun, probably the throw," Betts said. "You don't get those opportunities very much. For me to be successful that time, is definitely something I take pride in." Betts hit his team-leading 12th homer, and third in three games. He led off with a drive into the Crawford Boxes in left field, connecting against Will Harris (2-2). "He cuts down a run to finish the sixth, then the first pitch thrown in eighth, he gives us the lead," Boston manager John Farrell said. "Just in a small snapshot, there's Mookie's skill set on both sides of the ball. He's a dynamic player. Those throws aren't just by coincidence. The work he puts in, he throws a strike from right field at a key point in the game right there." Houston manager A.J. Hinch said it was an aggressive send to wave Springer, who was easily tagged out at home in the sixth. "Getting thrown out like that at that distance you're betting on a mistake," Hinch said. "It was a one-hopper bullet hit right at Betts. Betts makes a nice throw and they make the play." Brian McCann tied it for Houston in the seventh, homering into the upper deck in right field off Drew Pomeranz. Joe Kelly (3-0) got two outs for the win. He retired Norichika Aoki on a liner to third with runners on second and third to end the seventh. Craig Kimbrel threw a perfect ninth for his 19th save. 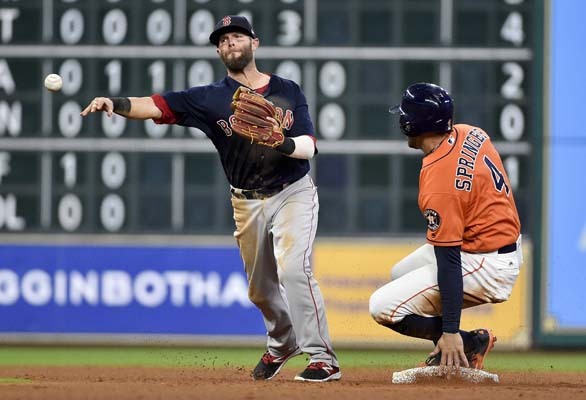 Mitch Moreland gave Boston a 1-0 lead with a single in the third that drove in Betts. Pomeranz allowed four hits and struck out four in 6 1/3 innings. He rebounded nicely after allowing six runs in 4 1/3 innings in his last start. 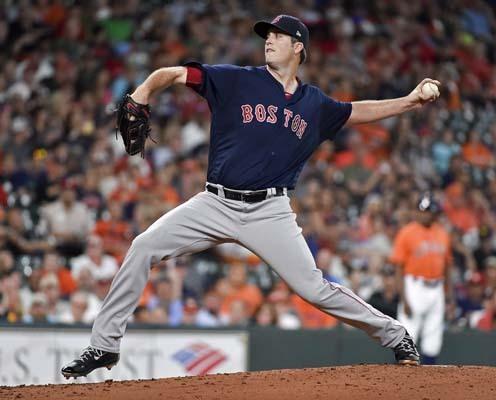 "I think my fastball location was a little better," Pomeranz said. "The breaking stuff was a little sharper, and I was a little more accurate with it. I think that goes a long way when I can place those where I want." Mike Fiers allowed one run on five hits with four strikeouts in seven innings. He set down his final 10 batters. "I was locked in all game; I felt really good. Just another game of getting ahead in the count and being the aggressor," Fiers said. "Not letting these guys get in too many hitters' counts and putting them away as early as you can and not try to go deep into the at-bat." The right-hander continued his string of good outings, allowing two runs or less in each of his last four starts. 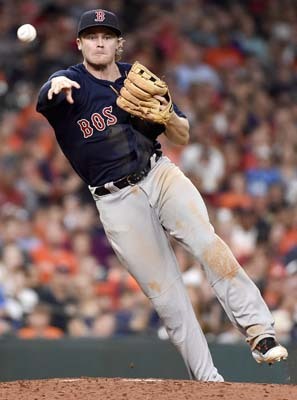 Red Sox: INF Hanley Ramirez was out of the lineup Friday with a muscle spasm in his neck. . Moreland is playing through a fractured big toe on his left foot. . RHP Carson Smith (Tommy John) will not make his scheduled rehab start Sunday due shoulder inflammation, Farrell said. Astros: RHP Charlie Morton (right lat strain) and RHP Collin McHugh (right elbow) each threw bullpen sessions. ... LHP Dallas Keuchel (neck discomfort) and RHP Lance McCullers (lower back discomfort) could begin playing catch soon, Hinch said. 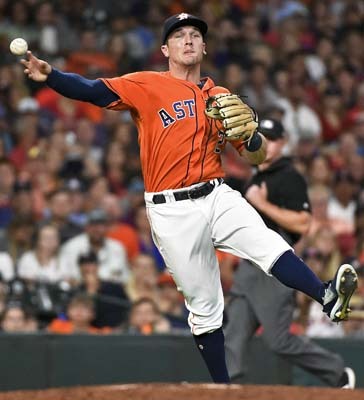 Hinch said he hopes to have them start a throwing program as early as this weekend. . OF Josh Reddick (concussion) resumed baseball activities Friday, Hinch said. "We knew coming in here this is going to be a strong test, a strong challenge. To pitch like we did tonight in their home ballpark, that was encouraging." - Farrell on facing the Astros, who have the best record in the Majors. Red Sox: RHP Rick Porcello (3-8) makes his 15th start of the season Saturday looking to break a three-game losing streak and rebound after giving up 11 runs over his last two starts. Astros: RHP David Paulino (0-0) will make his fourth start this season Saturday looking to bounce back after being tagged for five runs in four innings in his last outing.